Our goal is to minimize down time by responding fast to service calls. 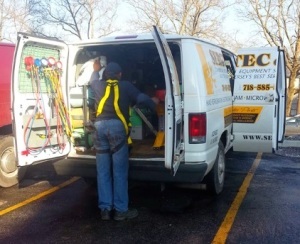 Our CFESA Certified Technicians will arrive in a fully stocked service vehicle to quickly restore your equipment to its original specification. We service and maintain all commercial kitchen equipment as well as HVAC systems. Our master technicians will do their best to help extend the life of your equipment and minimize revenue lost. Simply put, we strive to be fast and efficient, to make the experience of equipment failure as pleasant as possible. Give us the opportunity to serve you.